In tribute to one of the most beautiful places on earth, precious metals have been transformed into wearable art, with history and lore taking center stage. The Chesapeake Bay Hook BraceletTM is forged with pride for the Bay and for all those who live, work and play by the largest shoreline in the US. A Blue Crab shapes a "C", which hooks a three strand line "B" that echoes the nautical heritage of the Bay, and together symbolizes the hook that the Bay has on the hearts of many. A likeness of the Old Cape Henry Light, the first lighthouse erected on the Bay, is displayed to remind us all of our duties to stand watch in the protection of one of our most prized natural bodies of water. 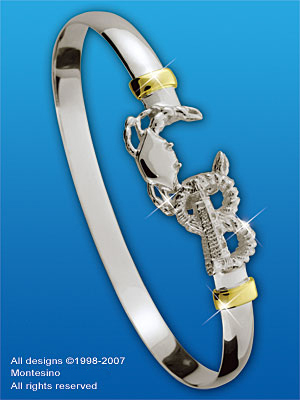 The Chesapeake Bay Hook BraceletTM is a symbolic treasure which is sure to conjure dramatic scenes of nature and life on the banks of the Chesapeake Bay.